And what is that theme? Well, it's that the popular vote and the Electoral College are significantly diverging. Although the Republicans seem to be polling stronger than they were in the pre-convention period almost everywhere, the differences are much larger in traditionally red states, particularly in the South and the rural West (Colorado and Nevada, by the way, are not rural states). Basically, I think the Republicans are getting the evangelical vote, and a significant fraction of the Perot vote. Unfortunately, these are not particularly useful votes for them to have in terms of the electoral math. Here is a comparison of our projected margins of victory on August 26th -- the Tuesday of the Democratic convention, before polling had any chance to take Michelle Obama's opening night speech into effect -- with our projections today in a select group of states that have been polled since the RNC ended. 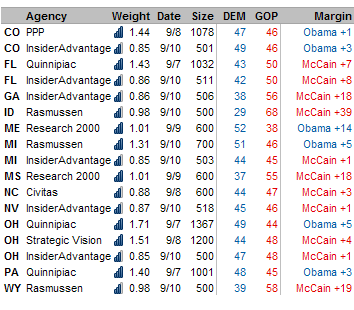 McCain's gain in our popular vote projection has been 2.1 points. Note, however, that his gains have been less than that in essentially all of the most important swing states, including Ohio, Michigan, Florida, Colorado, Pennsylvania and New Hampshire. Only Virginia is on the other side of the line, and then only barely so. As a result of all this, the Electoral College remains too close to call, even though McCain has a 1-2 point advantage in the popular vote. Obama now has an 8.4 percent chance of winning the Electoral College while losing the popular vote, which is far and away the highest that this number has been all year. And that number may get larger rather than smaller, once polling filters in from other red states like Texas, Nebraska and South Carolina. Palin may have been a brilliant VP selection -- I think even Palinophobes like me have to concede that right now McCain's looking pretty savvy -- but some of that sheen is taken off by her somewhat lackluster effect on the Electoral College.